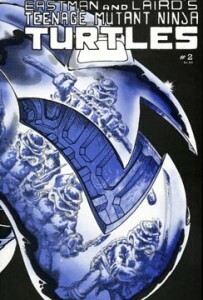 The second issue introduced April O’Neil and Baxter Stockman. The book begins with the Turtles and Splinter watching the news. The reporter, Ms. Hynes, is doing a story about Dr. Baxter Stockman and his new invention: the rodent-killing robotic Mouser. Stockman, with the help of his lovely assistant April O’Neil, demonstrate the Mouser’s ability to track and slay rats. Splinter cautions the Turtles that they must be very careful with this new threat in town. Several weeks pass, and in that time many bank robberies have occurred. April is reading the paper to Dr. Stockman, which describes strange small tunnels dug into the bank’s vaults. April hypothesizes that the Mousers would be capable of doing this, which the good Doctor promptly dismisses, pointing out the April had helped to program them, so she should know better. Stockman then proceeds to take Ms. O’Neil to an underground security level of the laboratory, where he shows her an army of Mousers that are being built. April demands to know how he got the funding to build hundreds of Mousers… when she concludes that her suspicions were correct: the Mousers were robbing the banks! Stockman then reveals his plan to blackmail the City. April is confused, as she notes that Stockman could have made millions legally with his invention. Dr. Stockman replies that he’s not doing it for money but because it’s “fun.” April realizes that the Doc is quite mad and she bolts for the elevator. Stockman then programs the elevator to drop her into the sewers, and sends several mousers to kill her. Just as she’s about to be mauled, the Turtles show up and save her by destroying the robots. April faints at the sight of them! The TMNT take Ms. O’Neil to their home, and when she awakes, tell her their origin. The Turtles then turn on the news to find Stockman making his demands of the City. It seems that he’s had the Mousers dig tunnels underneath every corporate headquarters in New York, and if a ransom is not paid for each building, he will have the Mousers destroy the skyscrapers’ foundations, thus causing them to crash to the ground. 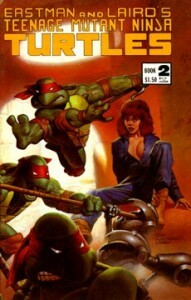 The Turtles and April decide that it’s up to them to stop the mad Doctor, and they sneak into his building. They confront Baxter, who sets off an explosion and traps them in the basement lab. The Turtles manage to blast a whole in a wall, but unfortunately it leads to the storage room full of Mousers! The horde of bloodthirsty robots attack! Leo, Raph and Mike struggle to hold them off, but there are too many! Just as it looks like it’s curtains for our heroes, Don and April manage to program the computer to shut down all power in the cellar… including the Mousers!